Well, I’ve been moving across the country, starting my own business, having a baby, and buying a house. It’s all in the little things. Those are all terribly huge things though. I stepped away from blogging because life got busy and I wasn’t sure I wanted to share the parenthood part of my life in such a public forum. To be honest, I’m not sure I’m “back”, but I was feeling nostalgic and in the mood to write tonight. So here goes! I got pregnant with a teeny tiny fetus last year, and Jonathan and I decided it would be best to raise our tiny tot in the midwest. It’s where my family lives and it feels like home. So much so we decided to buy a house in the heart of the city. It’s our first home and it’s almost 100 years old. Amazingly enough, we are only the fourth owners since the house was built in 1918! Pregnancy was not…the most wonderful time of my life, but I might save that for a different post. Highlights: 1) Gaining 20 pounds of water weight in the last month (hello…swelling!) 2) Feeling like I had the worst 24/7 hangover of my life 3) Craving tequila and donuts 4) At a certain point the only shoes I could wear were hideous clogs. 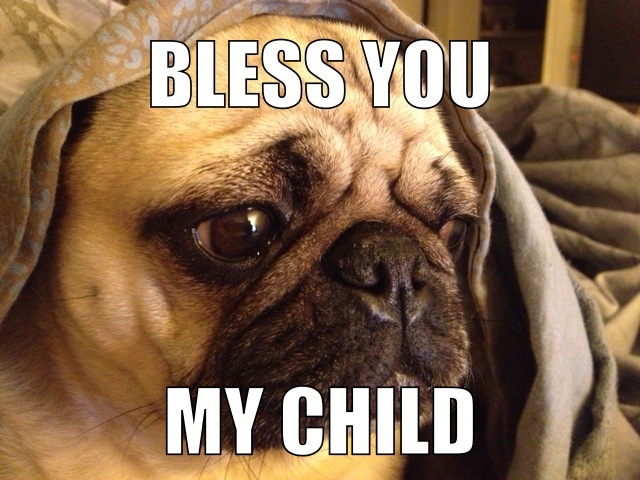 Basically, my body was rebelling against this foreign creature invading my uterus. Luckily there are moments like tiny kicks and rolls that make the pregnancy portion of events bearable. That tiny tot who caused such a fuss in utero is now a 9 month old wild and crazy baby girl. She is the most active child I’ve ever known, which is crazy because Jonathan and I are basically sloth-people. She’s constantly smiling and recently learned how to wave and to shake her head “no”. Child prodigy. Easily. There are a billion things people don’t tell you about having a kid, but one of the biggest things is how your love for your partner grows exponentially. Jonathan has been my best friend, partner, husband, teammate, lover, etc. But seeing him become the father of my child is an entirely new experience. I didn’t think I could love him more, but I do, and we will always be connected by our beautiful baby girl. I grew up with a fairly narrow view of ethnic cuisines. Anything outside of Chinese take-out or “Mexican food” served at Taco Bell was considered “icky”. As far as I was concerned, Pad Thai was the only acceptable Thai dish to my American palate. Luckily my tastes changed as I got older and was exposed more and more dishes and flavors from all around the world. I can’t imagine what life would be like now without all of the different cuisines I eat on a weekly basis. Thai food being among my favorites! My friend introduced me to Thai curries at a restaurant in Hollywood that features a Thai Elvis impersonator who croons to you during your meal. She suggested I try her panang curry and I’ve been hooked ever since. I’ve been experimenting with some Asian ingredients and attempting to make more authentic Asian meals at home. 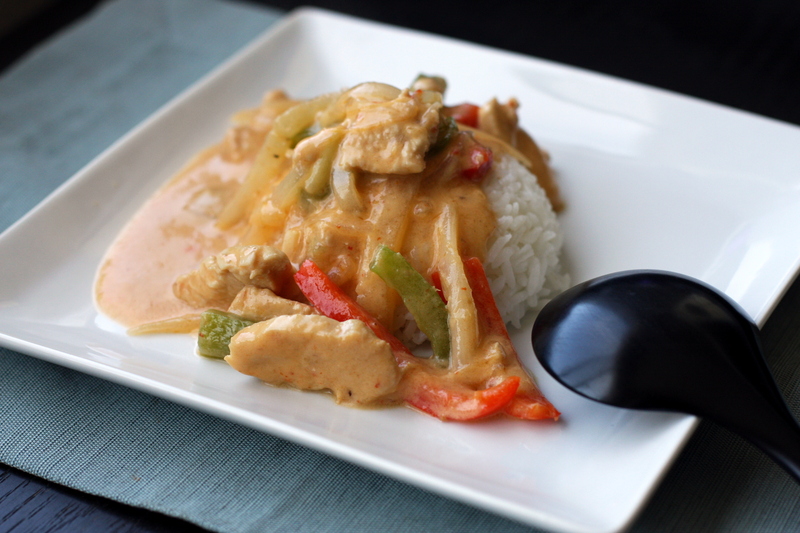 When I figured out I could make Thai curry at home, it was all over. Now, I can’t handle spice like a normal person (I’m from the Midwest, after all), but I do love the way this dish makes me sweat and my nose run. 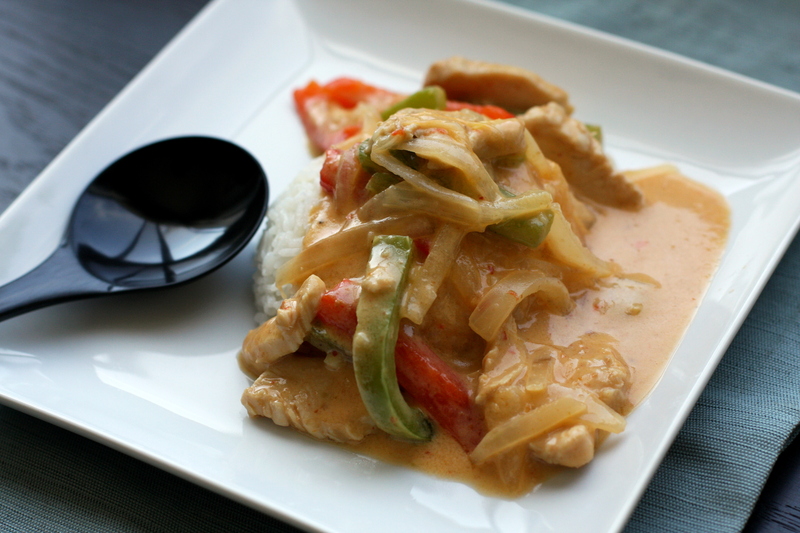 This recipe tastes authentic compared to what I’ve had in Thai restaurants, but I used ingredients that are easy to find. This dish has all of the aspects of Thai cooking that I have come to love: sweet, sour, spicy, and salty. Once you get the right balance of flavors, you can’t go wrong. I make this red curry at least every other week and I’ve made it enough times that it only takes about 15 minutes from start to finish. Pat chicken strips dry with a paper towel and sprinkle with salt and pepper. Heat coconut oil in a large pot over medium heat until shimmering. Add curry paste and garlic until it starts to brown slightly (about 1 minute). Add chicken to the pot and mix until chicken is fully coated with the curry paste. Cook for about 1 minute. 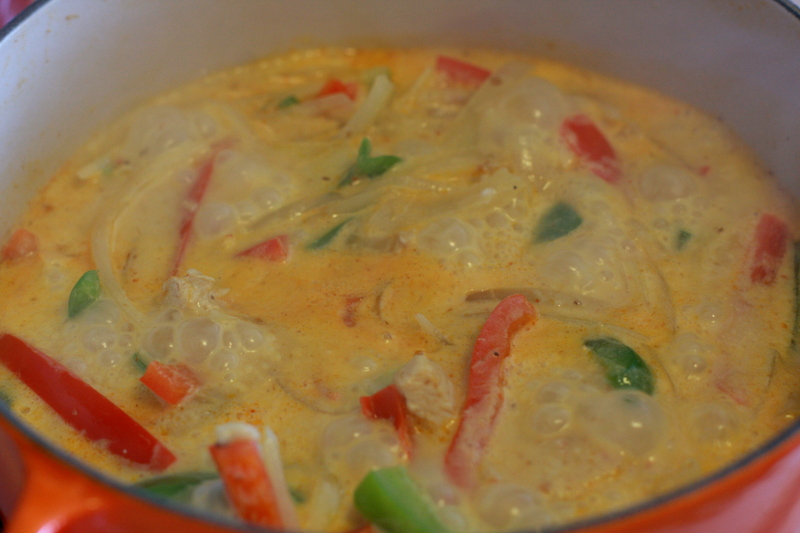 Add coconut milk and water, and bring to simmer. Simmer for about 4 minutes. Add peppers and onions, simmering for another 4 minutes. If you want thicker curry (I always do), add the optional corn starch and water slurry now. Stir in and simmer until the curry has thickened. Remove from heat and add the rest of the ingredients through basil. Taste and adjust as needed. Notes on this recipe: You can add any veggies to this dish, but peppers and onions are my favorite. I frequently see carrots, baby corn, tomatoes, snap peas, and green beans in other versions of this curry. I’ve found that 2 Tbsp. of the curry paste is just right. Any more and it’s so spicy I can’t eat it. Any less and I can’t taste the curry flavor. If you can handle heat better than this Midwesterner, you can always add an extra teaspoon or two at the end of cooking. You can make homemade curry paste or you can buy a giant tub at a local Asian market or on Amazon.com for about $5. One tub will last forever in the fridge; I’ve made about 10 curries with the same tub. Don’t skip or substitute the curry paste…it’s essential. More traditional recipes call for kaffir lime leaves, but I find lime juice works just as easily and is a lot easier to find at the grocery store. 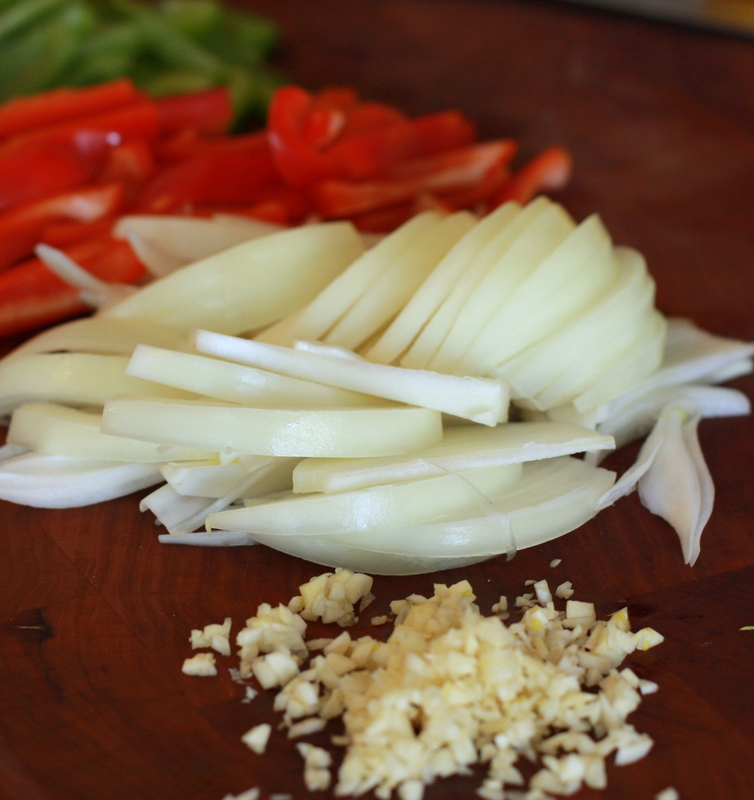 Do you cook a variety of ethnic cuisines at home? What’s your favorite to prepare? A few weeks ago I posted about going on an elimination diet and then I disappeared from the internet. Well, I did 10 days of strict elimination dieting, but then I went out of town for about 3 weeks and had a hard time updating my progress…obviously. The plus side of my time off was that I got to meet my new baby niece (SO EXCITING) and meet some of my blogging friends in Houston (ALSO EXCITING). The downside is that you were left hanging. For 10 days I avoided dairy, gluten, eggs, citrus fruits, nightshade vegetables like tomatoes, alcohol, and chocolate. I did all this because my acid reflux was getting out of control and the next steps would have been surgery. Yikes! I tend to roll my eyes at “natural remedies” because I am a researcher, and pseudoscience without evidence doesn’t sit well with me, but I was in so much pain I was willing to try anything. The results were astounding. To be clear, I went off of my acid reflux medication (and all other medications), did the 10 day “cleanse”, and removed significant stress from my life all at the same time, so I’m not sure which contributed the most to my health. Whatever it was, I feel incredible. I can wake up without pain for the first time in months, maybe even years! I still have some heartburn when I eat large meals and if I eat right before bed, but even that pain is limited. Alcohol almost always causes a great deal of pain, so our relationship is still tumultuous. I am thinking about trying another elimination diet soon just to see if I feel even better, as traveling interrupted my plans to try the diet for 30 days. I would highly recommend trying this for anyone who has mysterious health problems, as long as they have the go-ahead by their doctor. As you might imagine, an elimination diet is not really exciting for your palate, but I did find a few foods that I really loved. These are healthy and can translate easily into any diet. First, check out my Beetberry Smoothie recipe here. 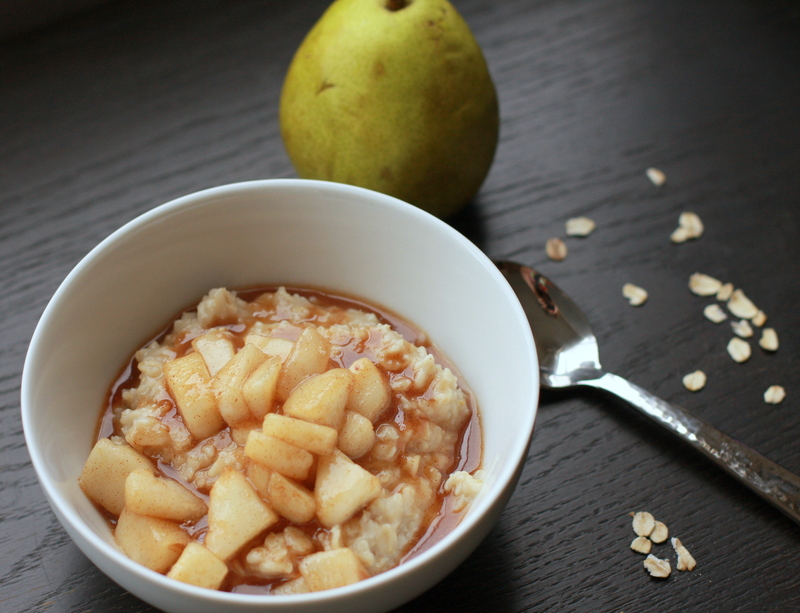 I also made these fabulous and easy maple pear oats! It’s so easy, it’s hardly a recipe, but you still need this in your life. Bring water to slow boil in saucepan. 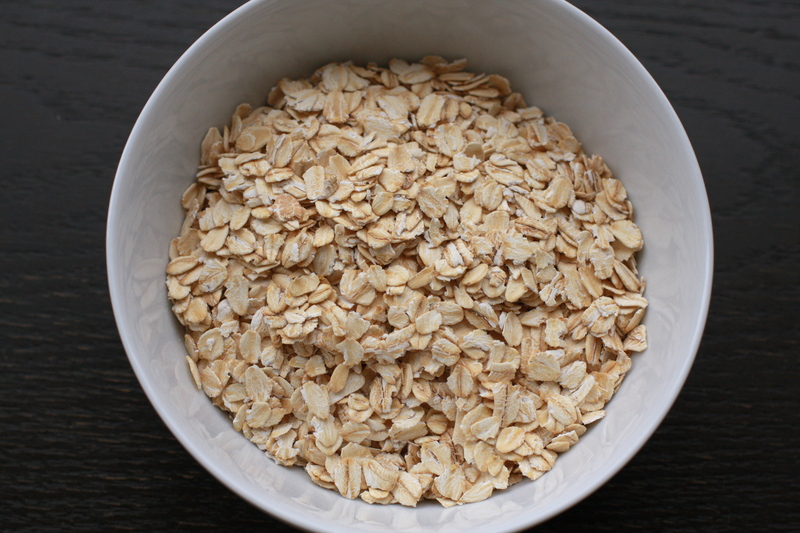 Add oats, vanilla, and salt to boiling water and reduce heat to simmer. Cook for about 10 minutes or until oats are cooked to your liking. 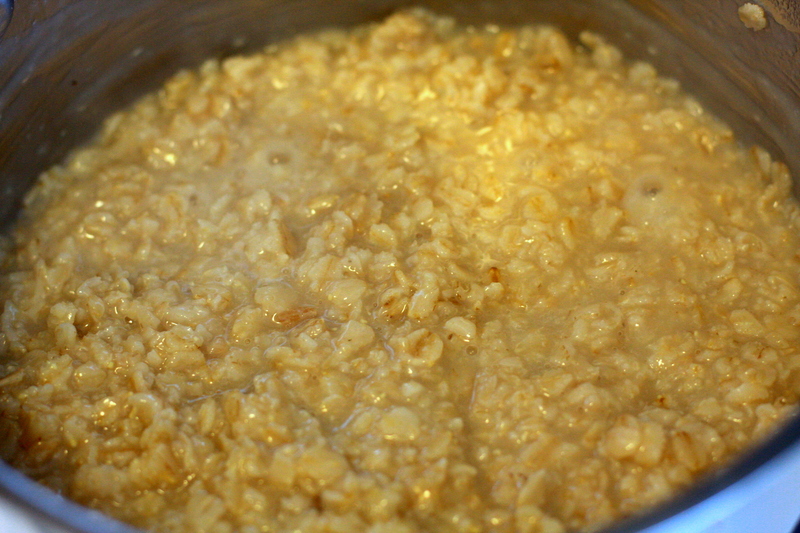 I usually like softer oats, so I cook them for the full 10 minutes, adding water as needed. In a skillet over medium heat, melt butter, then add the pear, cinnamon, and maple syrup. Cook until pear softens slightly and syrup thickens a bit. 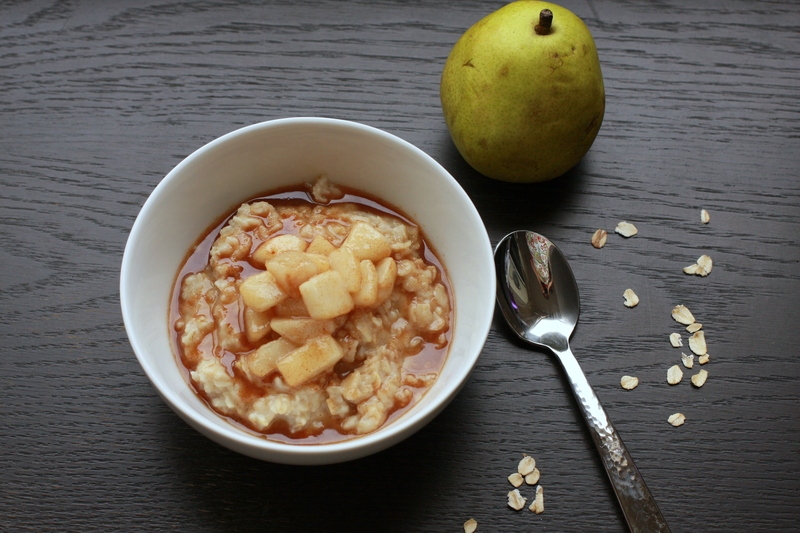 Pour pear mixture over oats. 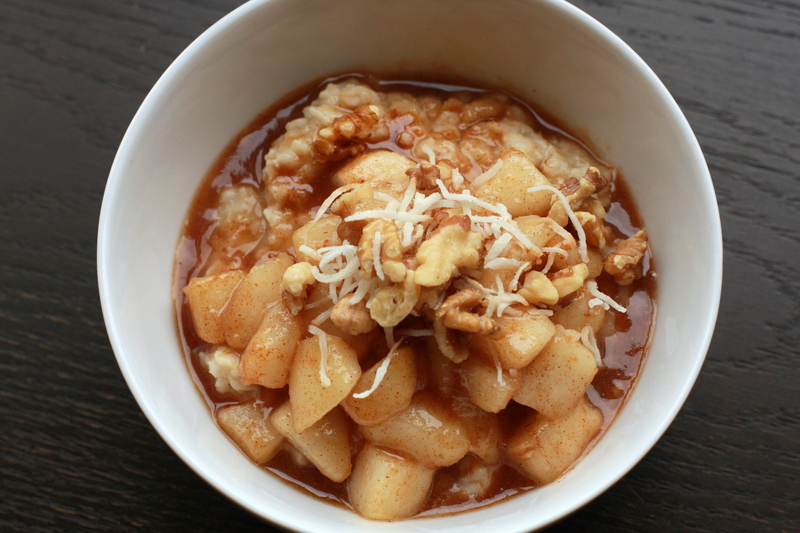 Top with toasted walnuts and coconut and enjoy! -You can easily substitute peaches, apple, banana, etc. 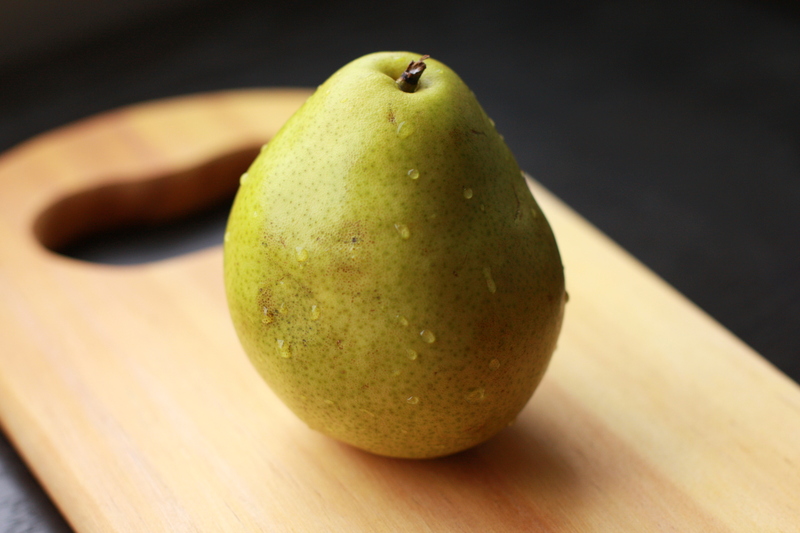 for the pear. I make variations of this recipe several times per week and it never gets old. -If you are on the elimination diet and don’t want to eat the trace amounts of gluten in oats, you can use Bob’s Red Mill Gluten Free Hot Cereal, which is mostly whole wheat brown rice. That’s what I used during my 10-day cleanse. 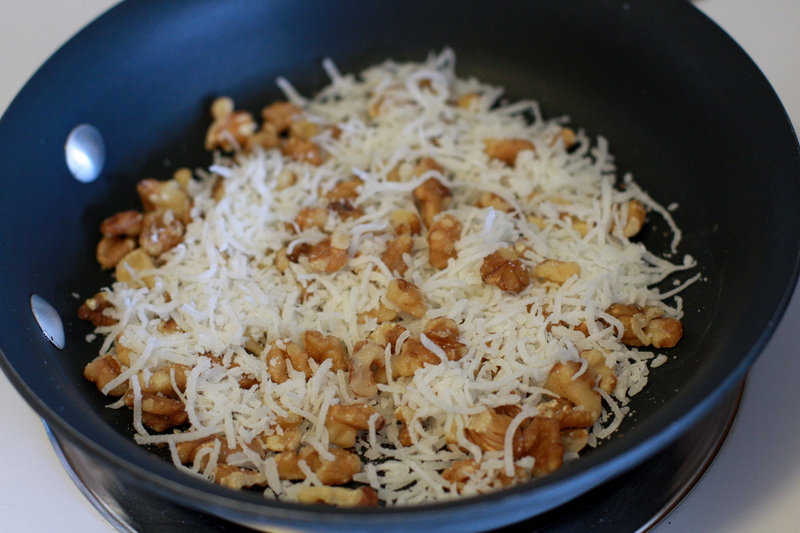 To toast the walnuts and shredded coconut, simply place them in a dry skillet over medium heat for a few minutes. The coconut will turn a golden brown color and the nuts will start to smell really nutty and delicious. Have you tried an elimination diet? How did it go? Princess Sophie, my parents’ dog. I added the moniker “princess” because, well, look at her. 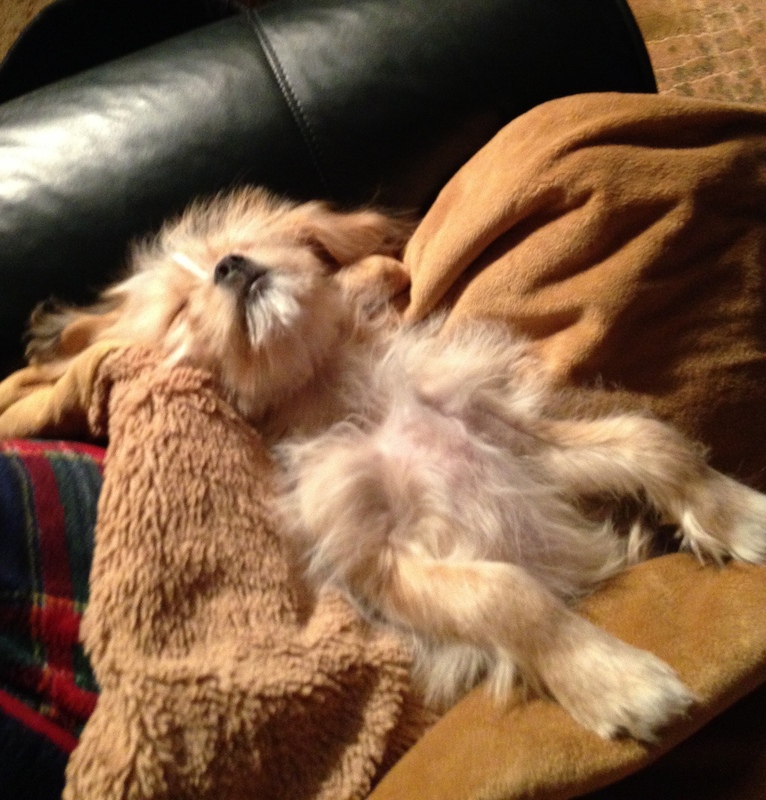 She’s a King Cavalier and Shih Tzu mix. Once every few months, my friends get together for a “meat-up”. This entails shoveling our faces full of all-you-can-eat meat at any local BBQ establishment. If you’ve never had Korean BBQ before, it is quite an experience. 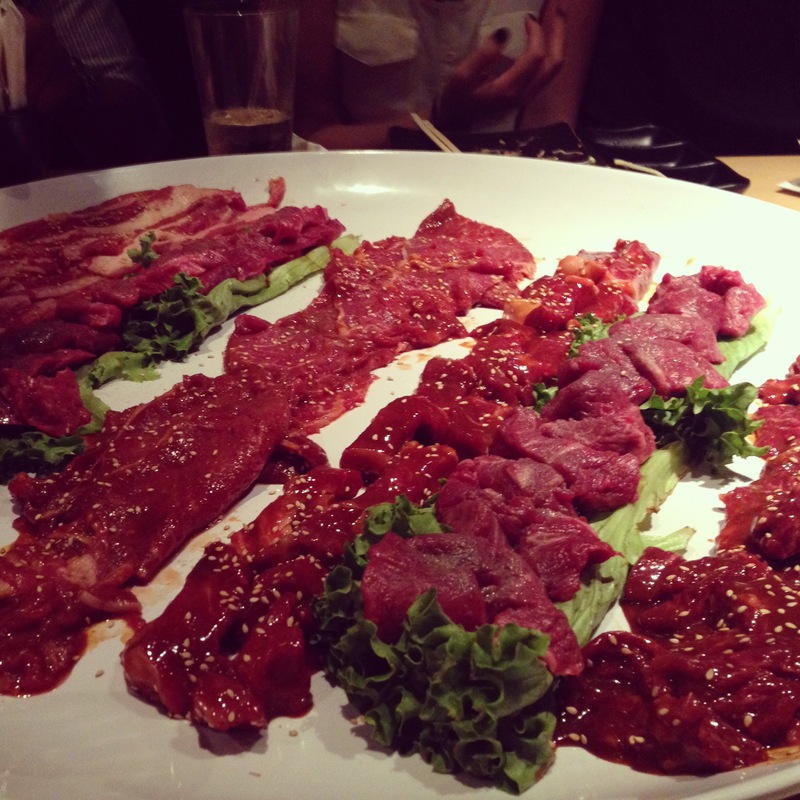 You point to whatever types of meat look tasty on the menu (bulgogi beef, kalbi pork, squid, chicken, etc.) and it’s brought to you raw at the table. Each table has a little grill and you grill the meats while you chat and dine on side dishes. Then you feast! 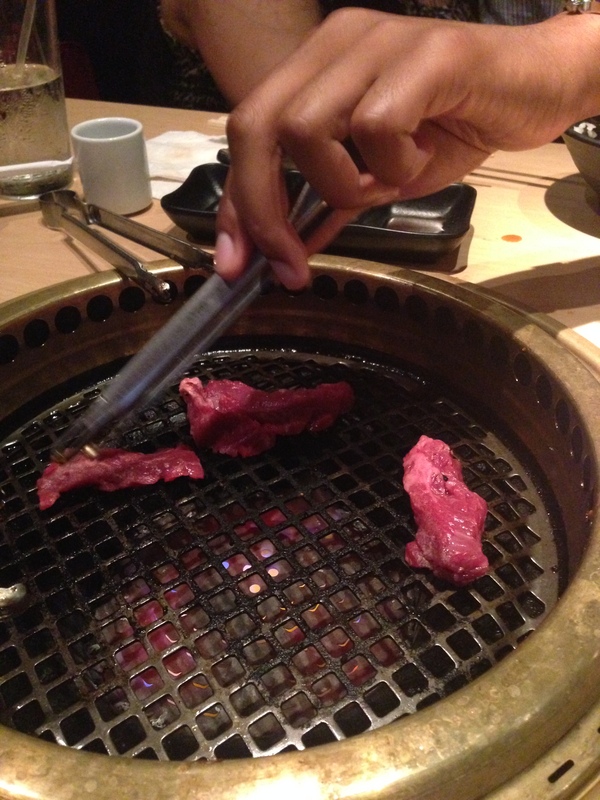 A recent “meat-up” at a Japanese BBQ. Meat fields forever. The dishes taste very different from Korean BBQ, but the concept of grilling endless amounts of meat at your table is the same. Japanese BBQ grilled directly at the table. I’ve been making Korean marinades at home to replicate our meat-ups, but I haven’t written down a recipe until now. This isn’t authentic bulgogi, but the Korean chili paste adds extra oomph to this Asian-style marinade. I hope you enjoy it as much as I did! Thinly slice the steak or cut into bite sized cubes. Toss into a ziplock bag. Add all of the rest of the ingredients into the ziplock and squish the bag around with your hands until all of the ingredients are combined and all of the meat is covered in the marinade. 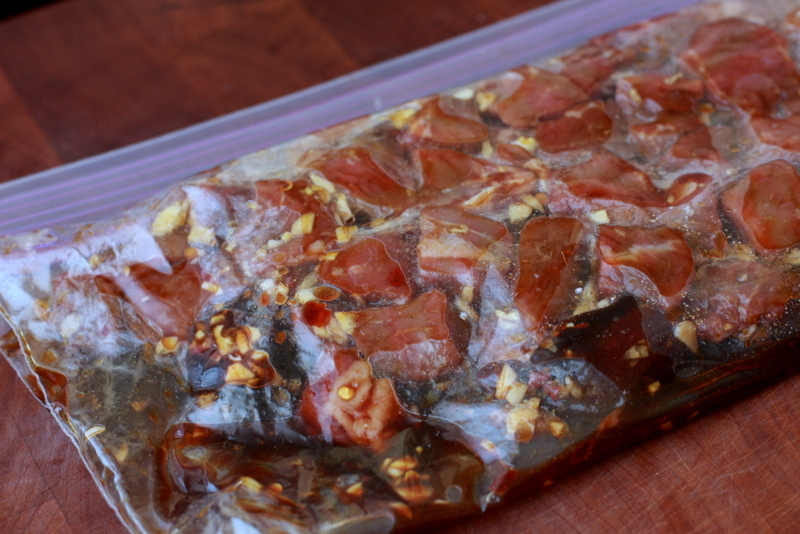 Seal it closed and marinade in the fridge for at least 30 minutes…if you have time to marinate it overnight, do that. In a skillet over medium-high heat, add half of the meat mixture and brown both sides (1-2 minutes on each side, depending on how thin you sliced the meat). It should be a nice golden color. Repeat step 4 with the other half of the meat mixture. Serve over rice with a side of steamed broccoli. Notes on this recipe: You can find gochujang paste at any Asian market, but if you have trouble finding it near you, Amazon sells it online. Magic! It lasts an exceptionally long time in the fridge, but you can use it in meat marinades, soups, stir fry, dips, sauces, etc. I was hesitant to buy a whole jar of an ingredient that I was only using a tablespoon of in this recipe, but it’s so versatile you will have no trouble using it up. Cooking the meat in two batches ensures your pan will remain hot enough to get that lovely golden brown sear to the meat. If you add all of the meat at once, the pan cools off just enough so that your beef will steam. Nobody wants yo’ steamed meat! If you want to substitute fresh raw ginger you can. We like a mellow ginger flavor at our house, so we use the ground powder. Now we can have a version of KBBQ at home! The marinade is so easy to whip together that we eat it about once a week with different types of meat and veggies. 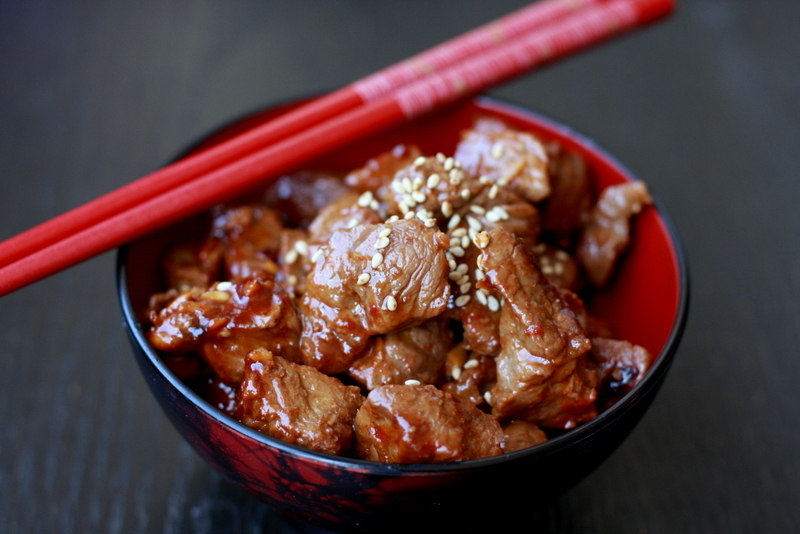 What’s your favorite secret ingredient in Asian marinades? Getting past the tv slump, simply means books have replaced my favorite shows because LEARNING. I feel like my brain function is slowly returning to me, one little neuron fire after another. I started slowly by reading Heat Wave, by “Richard Castle”, which is actually a book based on a tv show. 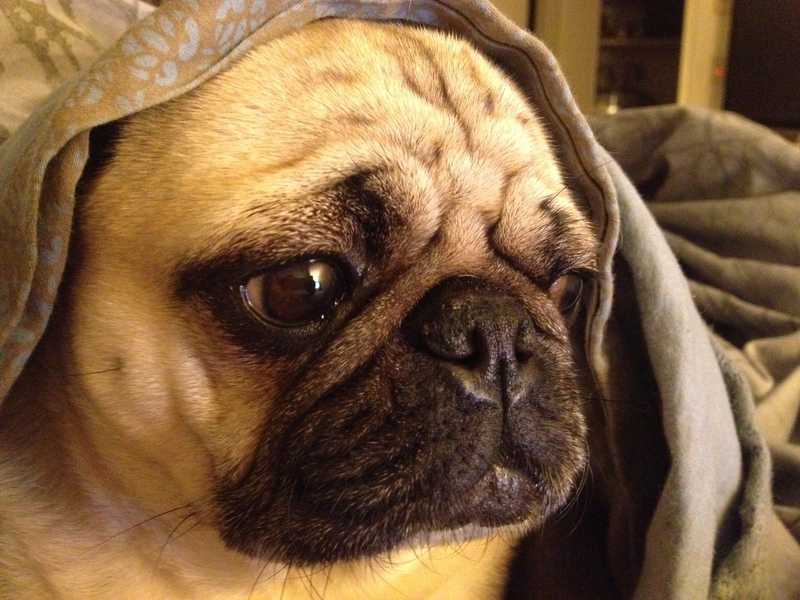 I told you, I was in a Netflix stupor! If you hate reading, but love watching tv, the Richard Castle books are for you. It reads more like a script than a novel, with so many pop culture references and grammatical errors, it’s almost impossible to read. One sentence actually used the term “cray-cray”. I thought the whole book was a joke, but diehard fans of the show (Jonathan) will probably need to own all books in the series. Not that I know anything about that…*cough*. The Handmaid’s Tale, by Margaret Atwood. I thought I would love this book. It has everything I usually love: a dystopian future, a female author, and strong feminist themes. However, the execution was a heavy-handed and boring, despite great reviews on Amazon. Gone Girl, by Gillian Flynn. The perspective and narration were totally unique and unexpected for a who-dun-it. It was definitely a page turner and took me by surprise. However, I was still hoping for a bit more complexity…I don’t know how to describe what was lacking, but I would give it a 3 out of 4 stars. The Rule of Four, by Ian Caldwell and Dustin Thomason. This book was heady and elitist, in part because it was set at Princeton University, but it was still intriguing. It had a lot of similarities to the Dan Brown series, but I have to say I prefer Dan Brown. Overall, it was a decent historical adventure. Rita Hayworth and the Shawshank Redemption, by Stephen King. This was my first time reading Stephen King, but I knew the story from the movie. I was surprised to discover the story was actually a novella and only 150 or so pages long. It’s incredible how well you know the characters in that amount of time. The writing was impeccable. I’m in the middle of his second novella in the Different Seasons series entitled, Apt Pupil, which is equally enthralling. After all of that reading, I was a little disappointed that I only really liked Gone Girl and Shawshank. I clearly need help picking out my next book. Do you have any recommendations? What are you reading right now?